Anywhoozles. 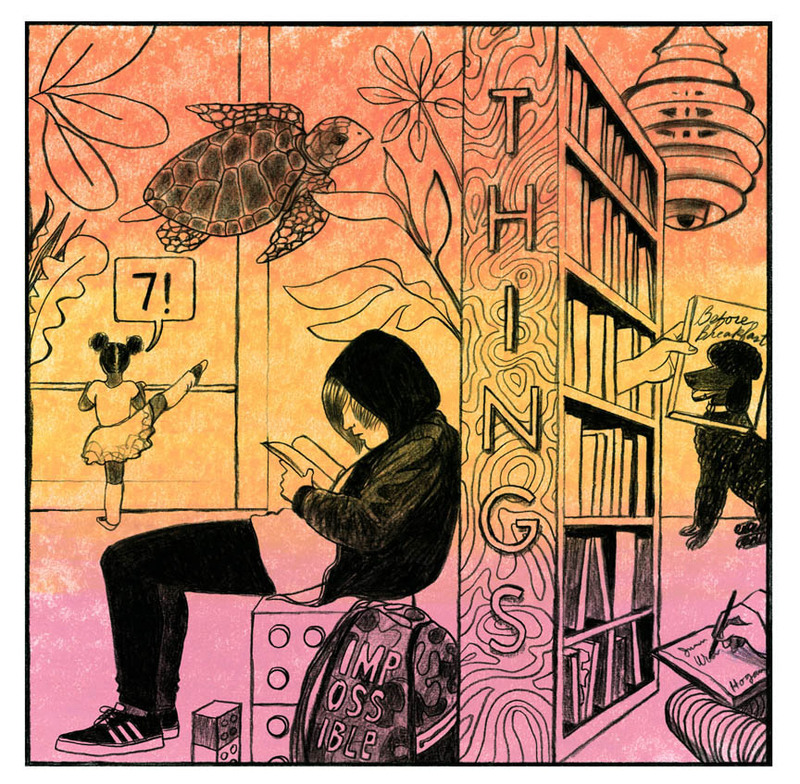 Jamie has created an illustration for a Portland (Maine) Public Library exhibit of panel art, and her illustration is inspired by 7-Imp. I mean, right?! 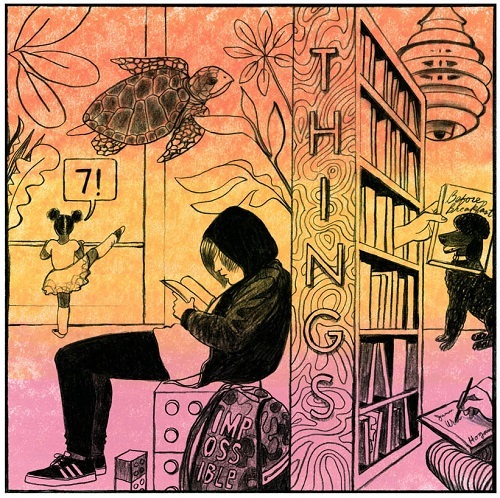 The image is above, and in this post, you can read more about it (she references seven things happening at this library, which she describes as a “hub of activity”). You can also read more about the library art show at that link. Thank you, Jamie! This is specialness. Illustration used by permission of Jamie Hogan. 2) The Horn Book’s coverage of the ALSC Awards. 6) Surviving a big home repair project. What a lovely tribute to 7 Imp! Very cool, Jamie. Jules: I haven’t seen the series yet – I don’t have that channel – I have seen her speak, and it was wonderful, very inspirational, very honest and positive. Yay for the magic of storytime, and three cheers for those posters. Adding Haley to my “listen to later” queue. How very cool! And you ARE a kidlit superhero! Jules – I adore Issa Rae & Insecure, hope you are enjoying it too. I will have to read that article on Storytime & listen to Hayley Hendricks later. What was the home improvement project? LW – Making people laugh is the best. Really love that its followed by kicks 3-7. 1) Finally saw Spiderman: Homecoming & very much loved its earnestness & energy & the relationships between the friends. 2) A Portland Thorns game Wednesday was a great place to be to comiserate after the news cycle – even though it was a draw. 3) Walked part of the way home after the match & got some amazing photos of the riverfront from the Hwthorne Bridge. Portland in summer is so pretty. 5) World Cup games, that incredible save today byt eh Russian goalie! 7) Fat Cupcake mini-cupcakes for continued birthday celebrations. LW: Making people laugh? Please tell me you’re doing stand-up now. I would believe it, because I’m convinced you can do anything. Rachel: To answer your question, we had to have the ENTIRE HOUSE re-piped. The plumbers, however, got it done in one day. ONE DAY. Pretty impressive. They rocked it. As I type, the drywall-repair person is fixing some of the 15 holes left in our walls and ceilings. I’m grateful we can afford to have this fixed (I want to stress that for sure, as this is certainly a first-world problem to have, as they say), but it’s requiring patience for sure. … I love your 4th kick, and I like YOUR home-improvement project. Cupcakes. Mmm. Rachel: Yay for good, earnest entertainment and people. And pups – Hi Daisy! Jules: Thanks for having such faith in me! I’m not doing stand-up. Rock those new pipes!